Italy entered the Allied cause in 1915 and for the next two years the fighting took place between Italian troops and units from the Austro-Hungarian Empire. At the Battle of Caporetto the entire course of the war in Italy changed and it look as if the Italian Army might collapse. 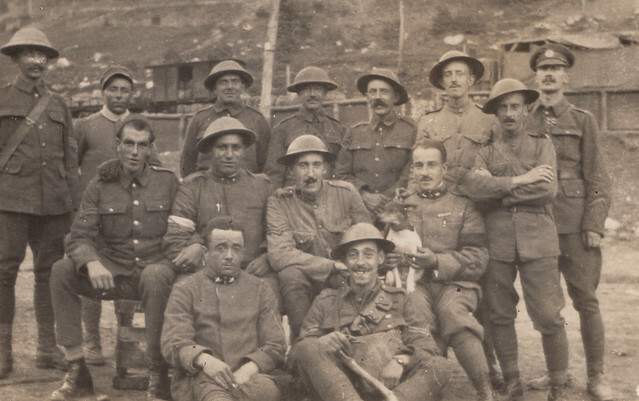 British troops were transferred from the Western Front from October 1917 and found themselves in some cases moving from the mud and slime of Passchendaele to an Italian winter, which several veterans I interviewed who fought there thought was much more preferable! The British units found themselves in Northern Italian, principally in the area around Asiago. They would remain here, later joined by both French and American units, until the Austro-Hungarian forces collapsed in October 1918. By this time more than 1,000 British soldiers had died in Italy, with more than 5,000 wounded or sick. This photograph shows British and Italian troops at a railway siding. The British soldiers are Royal Engineers and may well be from the Railway Operating Division running the railway system that supported the British forces here. This entry was posted on 18/10/2012 by sommecourt. It was filed under British Army, Forgotten Fronts, Great War, Italy 1918, WW1, WW1 Transport and was tagged with 1918, Asiago, Caporetto, Forgotten Fronts, Italian Army, Italy WW1, Royal Engineers. Many thanks for this post, Paul, even if, at least to an italian-centric point of view, Italy is not a forgotten front… May I know if you have more information about this pic? Do you know where it was taken? Sadly I know very little as there is no caption with it. I purchased it many years ago in a junk shop in the UK. Campiello ? On the Rocchette-Asiago narrow gauge.